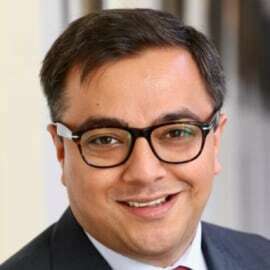 Mukul Dhyani is Country Head for Wipro Germany and Switzerland. In this region, Wipro has more than 2,000 employees and has over 11 delivery locations with an annual turnover of about 790,000,000 euros. Mukul Dhyani has over 18 years of professional experience in 5 European countries and has worked for projects in Singapore and the US. He is an expert in finding the best technologies for solving business problems and opening up new growth opportunities for our partners. Prior to his current position, he led the Wipro Manufacturing Services business in Europe and held several regional management positions, allowing him to set up and scale key operations for IT companies in Central Europe. He also worked in the past as a management consultant. He is a member of the advisory board of several Fortune 500 companies and supports them with regard to digitization, automation and IT roadmap development. In the past, he continued to set up nearshore engineering and application services centers in Romania and Poland, and last year successfully led the acquisition and integration of an IT services company in Germany.